In the early 1950s, both the South Bend/Mishawaka and Elkhart/Goshen local economies featured very strong manufacturing sectors. More than half of all employment in both economies was in manufacturing. In the 1960s and 1970s, employment in the South Bend/Mishawaka local economy, like most local economies in the U.S., shifted from manufacturing to non-manufacturing. By 2000, manufacturng employment made up only 16 percent of total employment. In contrast, manufacturing employment in the Elkhart/Goshen economy, led by the recreational vehicle and manufactured housing industries, continued to grow as fast as non-manufacturing employment. In 2000, manufacturing employment made up 51 percent of total employment, the highest percentage of any metropolitan statistical area in the U.S. Table 1 shows average unemployment rates and uses seasonally adjusted index numbers to show average levels of employment for the years 1995 through the first half of 2002. Figure 1 indicates the trends mentioned above were continuing until 2002, with manufacturing employment in South Bend declining 2.7 percent from 1995 through 2000, and manufacturing employment in Elkhart growing 9.8 percent during the same period. Recently, manufacturing employment has declined in both local economies. 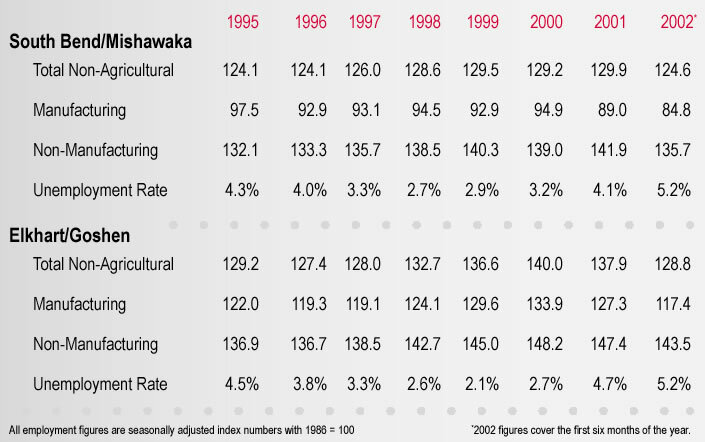 The South Bend/Mishawaka economy performed well from 1995 through 2001 but started to decline significantly in the first quarter of 2002. Total employment grew slowly from 1995 through the first quarter of 2001, increasing by 13 percent during this period. It leveled off for the rest of 2001 before declining sharply in January 2002. Non-manufacturing employment increased slowly from 1995 through the second quarter of 2001, growing by 16 percent, before declining in the third and fourth quarters. Manufacturing employment was up and down depending upon the national economy and the specific situations facing local firms. The recent recession at the national level is reflected locally by a nearly 9 percent drop in total employment, a 14 percent drop in manufacturing employment, and a nearly 5 percent drop in non-manufacturing employment from March 2001 to January 2002. Manufacturing employment has increased by 5 percent and total employment has increased by 2.3 since January 2002. Unemployment rates dropped from an average of 4.3 percent in 1995 to 2.3 percent in 1998 and remained at very low levels until the recent recession. The local labor market was very tight from 1997 through 2000, but the recent recession has increased monthly unemployment rates significantly since early 2001. 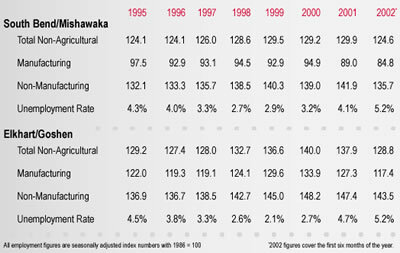 The Elkhart/Goshen economy performed well from 1995 through 2000, except for a dip in 1996. From 1995 through 2000, total employment grew 12 percent. Total employment declined in 2001, with the rate of decline picking up in the third and fourth quarters. Manufacturing jobs increased each year from 1997 to 2000 until declining in 2001. The decline was modest for most of 2001, but it increased significantly in the fourth quarter of 2001 and the first quarter of 2002. Non-manufacturing jobs increased every year until 2001, except for a slight decline in 1996. The level of non-manufacturing employment held up reasonably well until it declined in the fourth quarter of 2001. It increased slightly in the first quarter of 2002 before declining again in the second quarter. Unemployment rates dropped from 4.5 percent in 1995 to 2.1 percent in 1999 and remained at very low levels, until increasing to 4.7 percent in 2001. The monthly rates rose to an average of 6.3 percent for the fourth quarter of 2001 and 5.8 percent for the first quarter of 2002 as the recession really impacted manufacturing. Data from Table 1 for the first six months of 2002, together with recently released data for August 2002, suggest that both local economies are recovering from their troughs in January, although Elkhart's recovery is much stronger at this stage. Total employment in South Bend is up less than 1 percent for the first eight months of 2002, while in Elkhart it is up almost 4 percent. In South Bend, manufacturing employment is up 5.7 percent for the first eight months of 2002 versus an increase of 6.4 percent for Elkhart. The average unemployment rate in South Bend is down from 5.5 percent in the first quarter of 2002 to 5.0 percent for August, and in Elkhart it is down from 5.8 percent in the first quarter to 4.5 percent for August 2002. Employment levels are rising in both local economies, but faster in the Elkhart economy. Accurately forecasting economic conditions for local economies is very difficult for two reasons. First, we have much less economic information available for local economies than for larger economies, and the data we do have tends to be less accurate. Secondly, special situations affecting individual firms, which would have little impact on a regional or national forecast, can have a major impact on a local economy. The uncertainty surrounding these special situations creates uncertainty about the forecast. At the present time, we have several special situations that have the potential to impact our local economies over the next couple of years. AM General is producing H-2 vehicles (Hummers) in St. Joseph County for General Motors. Approximately 1,000 workers have been hired at wages well above the local average for production workers. Since almost all of the sales will be outside our area, and since it is likely additional new jobs will be created to supply this plant, the multiplier effect will be substantial. This development is having a substantial impact on local employment and local income. Crowe Chizek and Company, one of our largest local employers, announced an expansion in South Bend last year. While some firms in the accounting industry have faced difficulties this year, Crowe Chizek's expansion continues to move forward. The company plans to hire a significant number of new employees in this area over the next two to four years. Work on the expanded headquarters is completed and employees have begun moving into the new areas of the facility. Since this is the company's national headquarters, much of the income supporting these new positions will come from outside our area. Many of these jobs will be high paying with excellent fringe benefits. While the multiplier effect will be smaller than the General Motors one, it will still be substantial. Local employment and income will increase from Crowe Chizek's expansion, although some of the impact will occur beyond our forecast period. Finally, the recreational vehicle industry is recovering very quickly from the recession, increasing production at a 15 percent rate for 2002. This is one of the largest local industries, and it is having a major impact, especially in Elkhart. This industry's impact is magnified by the large number of local firms supplying the recreational vehicle producers. The combined effect of these special situations is clearly positive for our local economy. On the negative side, Bayer Corp. is shutting down its consumer care division in Elkhart. This shutdown will result in the loss of approximately 350 high-paying production jobs. Since almost all of the production is sold outside our local economy, there will be a sizable multiplier effect. In addition, our area has lost many jobs over the last two years in the auto supply industry. While most of the failing firms have been small, the total number of jobs lost is more than 1,000. This lost income will also have a negative multiplier effect on the local area. Like most local economies, the South Bend/Mishawaka and Elkhart/Goshen economies are greatly influenced by the national economy. The durable goods component of the national economy, and especially the automobile, manufactured housing, recreational vehicle, and steel industries have a big impact on our local economies. Since the Elkhart economy has very substantial manufacturing employment, it tends to be affected quickly and significantly by movements in the national economy. The Elkhart economy, led by the growth in recreational vehicle production, has recovered more quickly than the South Bend economy. The national forecast shows declines in durable goods spending in the fourth quarter, and relatively slow growth for all of 2003. The model calls for little growth in domestic automobile production and in new housing starts. As a result, we expect both local economies to continue their recoveries, but at a modest rate.